Last year, my wife and I had the pleasure of visiting some friends in South Dakota. They were some of the best hosts. Each day we went on a different adventure to see the sites. 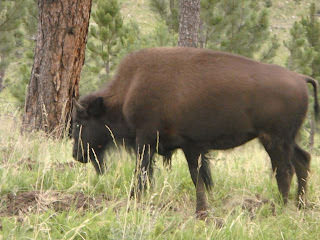 On one of those trips to the Custard State Park, we came across a heard of Bison, or the American Buffalo. The bison once roamed the grasslands of North America in massive herds, became nearly extinct by a combination of commercial hunting and slaughter in the 19th century. (At least according to wikipedia). On our little visit we saw about 500 or 600, with some young ones running along with the others. Having the opportunity to see these magnificent creatures up close was awesome. 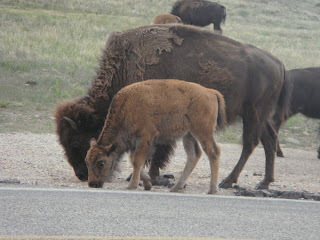 You can drive through the park, and some of the bison are big enough to run small cars off the road. South Dakota is a great place to visit. Make sure you stop by and see the bison. What an amazing sight that must have been. I too have seen them in the "wild". They are massive creatures but a wonderment to look at.